Specificity/Sensitivity: This antibody does not cross react with rat or frog AChE, and does not detect butyrylcholinesterase (BChE). Immunohistochemical staining of AChE in human brain samples with GTX22803 results in staining of nerve fibers and terminals. 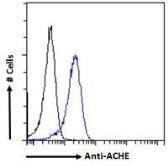 Specificity/Sensitivity: This antibody reacts with both the soluble and membrane-associated AChE. Specificity/Sensitivity: This antibody is expected to recognise isoform NP_000656 only (the ubiquitously expressed, hydrophillic form).